Are you interested in Homesteading? 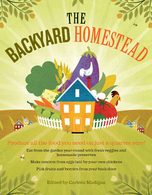 If you are interested in homesteading = this book is awesome! And you can win it this week at Homestead community! The Homestead community is an amazing place to connect with some other like-minded homesteaders. They are giving away 2 copies! Hope I you and I both win!!! Hi, I’m glad I found your blog since my husband and I just moved last year from the busy Bay Area of California to buy a home and property here in Virginia! We also have 6 children (7 years and younger).